But now I must take you from Italy to America with this week’s book Made In The USA by Florence Cornish. It features 100 recipes showcasing American cuisine from breakfast classics to burgers and comfort food. The dishes are delicious, so if you love all things American, this book is for you! To make the burgers, put the mince, garlic, onion and mustard powders, salt, black pepper and nutmeg in a large bowl. Mix well with your hands, then divide the mixture into four equal-sized balls. Throw each ball, one at a time, between your hands with force five or six times. Then form each one into a disc about 1½cm thick and refrigerate. Preheat the oven to 200°C/392°F/Gas Mark 6. Spread the coals evenly over the basin of the barbecue and heat for 35-40 minutes until white hot. Brush each patty with the oil. Grill for 3 minutes per side if you like it pink in the middle, or a few minutes longer for well done. Spread the bacon rashers out flat and sandwich them between two baking trays. Cook in the oven for 4-6 minutes until crispy. Remove from the trays and set aside. Split the buns in half and brush the insides with the melted butter. Spread 2 heaped tbsp of peanut butter on top of each patty and top with 2 rashers of bacon. Dress the burgers with lettuce and onion to serve. Preheat the oven to 190°C/374°F/Gas Mark 5. Blitz the ginger nut and digestive biscuits in a food processor until really fine. 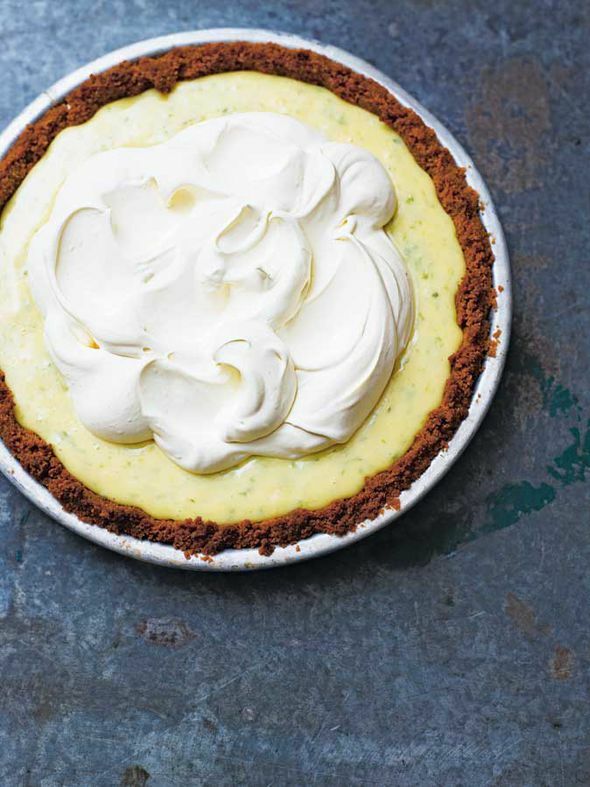 Stir through the melted butter and tip into a 22cm pie dish. Using your fingers, press the biscuit into the corners and up the sides of the dish to form a crust, then bake for 10 minutes. Remove from the oven and leave to cool fully. In a large bowl, beat together the condensed milk, egg yolks, lime zest and juice, and white rum, if using, until you have a smooth, lime-speckled mix. Pour into the pie dish and leave to set in the fridge for a minimum of 3 hours. When the pie is set, whip the double cream and icing sugar together to form soft peaks and pile high on the centre of the pie. Enjoy it in hearty slices.